At its essence, those three things are why we do content marketing. And if you’re not hitting all three, you’re likely not enjoying success with your content. Traditional marketing is big on the know — it’s all about creating awareness in the marketplace. Add in some clever messaging to prompt some level of liking, and mission accomplished, right? It’s as if awareness of a brand is enough to spark trust. And it’s true — we do tend to prefer brands that we know, even if there’s no true difference between one product and a generic one. But when it comes down to choosing between two or more brands, trust becomes critical. This is one of the benefits that content marketers have over competitors who don’t create and freely share valuable information — and it can be substantial if done correctly. Do you do what you say you’re going to do? Are your products and services solid? Do you treat customers fairly? Will you be in business next year? Do you abide by the core values you claim? Content marketing allows you to tell stories that touch on each of these over time. Even more, your brand can be viewed as not only trustworthy, but generous. Even selfless. In terms of persuasion techniques dating back to the time of Aristotle, ethos is an appeal to the authority, honesty, and credibility of the person speaking or writing. And that’s exactly what builds trust and influence when content marketing is done well. Disinterest here doesn’t mean you don’t care if you get a beneficial outcome — it means you serve your audience whether or not you get that benefit from any particular person. When you give away quality content that’s so good you could have charged money for it, you’re acting with “disinterested goodwill.” That means your audience received value regardless of whether they ever pay you a dime. It’s this very aspect of content marketing that makes it unacceptable to some business people. The thought of providing something valuable to “freeloaders” just drives them nuts. I’ve been giving away free, valuable content for 19 years, and all eight successful businesses I’ve started were powered by it. I have complete faith that I’m going to get benefits back — and the know, like, and trust I earn is the entire reason. Just the act of performing content marketing triggers the power of disinterested goodwill. Lacking that, there are techniques that persuaders use to achieve the same goal. A classic persuasion technique is the “reluctant conclusion.” You share with your audience how you had a change of heart based on overwhelming evidence. For example, you’ve recently raised the price of a product and discovered that it’s killing your sales. You could just quietly change the price back and hope no one notices, but you’ll build more trust and goodwill with your audience if you explain that you were wrong about the price raise and will be reverting it. Meanwhile, you’ve also met your goal of sparking dormant sales. It’s a win-win-win when you count the additional trust that you’ve built with your audience for future products and promotions. Another tactic is the “personal sacrifice” approach. Yes, the free online workshop you’re doing could have been a paid product, but you’ve decided not to charge for it so you can help more people. I’m sure you’ve seen this done many times before, with varying degrees of skill in the execution. The key to handling it well is, as always, to know your audience. And finally there’s the “Abraham Lincoln” technique. Lincoln was an unusual-looking guy with a hick accent and a whiny voice. When he gave speeches during his run for president, he added fuel to his personal fire by claiming to be a poor public speaker with nothing new to say. And yet, Lincoln was a very bright man with an excellent grasp of the nation’s problems. He lowered expectations by presenting himself as a sincere fool, and by the end of a speech he had won the audience over completely. So, if you’re a chiropractor who also does content marketing, it’s really easy to claim that you’re “no master copywriter,” even as you begin to deliver some damn persuasive copy. Again, you need to intimately know your audience to understand what’s appropriate when it comes to these things. Which brings us to something completely different. If any of the three tactics above sounded hokey or even manipulative, you’re not alone. That doesn’t mean they don’t work to build trust with certain audiences; they just might not work on you. That’s why I repeatedly say, “Know thy audience.” I don’t use those tactics on you, because I think I’d get a chorus of eye rolls. You’re more sophisticated about marketing than a typical audience, so those approaches might hurt more than help. Some marketers in our space have resorted to “radical transparency” in order to build trust. The problem with that, especially when talking about revenue growth, is it can come across as bragging more than honesty. And when things start going badly, you’ve got to maintain that transparency, which may actually reduce trust in your product or company. My approach is to simply never be shy about saying what’s in it for me. It was a lesson I learned back in 2007. I had been giving away valuable free content on Copyblogger for 18 months at that point. No product, no service, just relentless focus on serving and building the audience. Then a strange thing started happening. I began getting emails from people who didn’t understand why I was giving everything away for free without asking for a sale. It caught me off guard, but the people in my early audience were worried that they couldn’t trust me, because they didn’t understand what was in it for me. Color me shocked. So, even though I still try to be as generous as possible, I never shy away from saying what’s in it for me. If we’re doing our jobs correctly, what’s in it for you should always come across as superior — which makes it a sales strategy as well. For example, when we launch a new product that has special introductory pricing, we’re doing it for a reason beyond maximizing sales. We want feedback from our initial customers so we can rapidly improve the product. So, we explain that in great detail. And it’s worked on both the sales and feedback level every time. The more potential for skepticism within your audience, the more you just come right out and tell people the deal — for both sides. The most powerful way to establish yourself as a subject matter expert is to demonstrate your authority with your content rather than simply claim to be an expert. Trust works the same way. Other than that, the natural impulse to hide your economic motivations or business objectives is almost always a mistake. Realize that people increasingly think everyone is “on the take,” and your primary job is to assure your audience that you’re not. 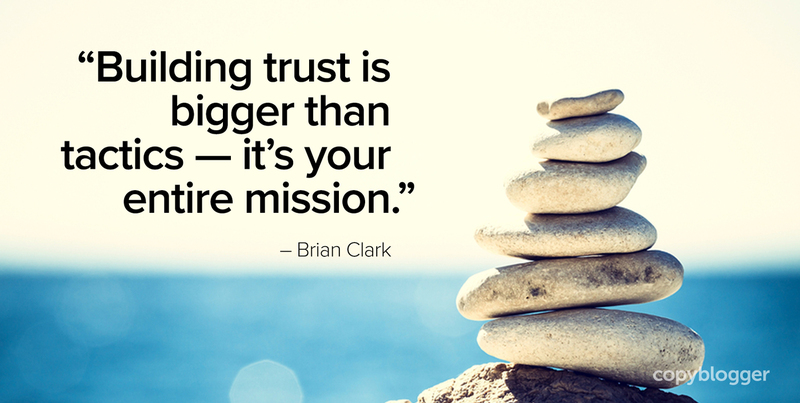 Building trust is bigger than tactics — it’s your entire mission. I’m officially coining the “What’s in it for you?” technique as the “Brian Clark” Technique. I hope I get a lot of replies on this comment so Brian will think I’m smart and generous, and will accept my guest post if I ever write one. Hashim, I think you’re smart and generous. Really powerful takeaway from this, Brian! There seems to be a unhealthy rise of people claiming to be experts – when their content is rehashed and rewritten – ugh! Seems like the Internet is fast becoming a rat race of how fast we can rewrite stuff, rather than come up with new tips, tricks and experiments that really push the boundaries of our respective industries. Sweet examples! This is really good info – you’ve got yourself a reader! So I interpret this as “disinterested goodwill” being one reason the online newspaper websites kept losing money, and decided to come up with pay-walls. Would that analogy be correct? I always know an article by Brian Clark will be worth reading because he’s earned my trust. That’s how it works, y’all. The most important message to me is that you should always tell the audience what is in it for you. It’s a lot easier to build trust that way! Great technique of which I plan to use more often. Very good article Brian. I think Amar Kumar made a very good point. “Marketing through content is not the same as advertising”. They are both good but different. I need to read your articles more often because I always find one takeaway that’s immediately applicable to my business. I think in some ways all of these can be summarized as “genuine transparency” that you preach with your content marketing, but the individual specifics really bring the point home. I especially like the “what in it for you section?” There’s no harm in disclosing it because people don’t care what’s in it for you–they care what’s in it for them. But like you said, knowing what’s in it for you makes sure people know there’s nothing they are missing. In example, I may not want to sign up for free copyblogger ebooks because I think the only way you could give away that great of free content is to sell my email. If you tell me that your email list is valuable when you have win-win paid offers in the future, that dispels my fears. LOL – this made me laugh, thank you for the post Brian. I’ve seen a number of bloggers starting out exactly as you did by giving away free valuable content. These bloggers are making a killing now with online courses. I do wonder though if it was easier for you guys starting in 2007. Do you think this ship has sailed or is it really possible to start simply with great content in 2017? I love this concept of disinterested goodwill. When you think about it, it really makes good sense. I also agree that demonstrating that you are trustworthy is a much better tactic that simply claiming to be an expert. Trust is a huge factor in all marketing and probably more so in online marketing due to the very nature of how we use the internet. I enjoyed your article, thanks. Right on Brian. I’m a strong believer of building trust with our clients/customers. This has served me where in one particular business I have never had the need to advertise it. Loyal customers are our assets. Have a great day. Thank you for the excellent advice! I’m researching content marketing because I want to offer good, valuable blog content on my website. My business is new and I realize that content marketing will be one of the most valuable strategies for me to boost my website’s seo, credibility, and brand. I’ve been having trouble brainstorming relevant topics, but this post made me think about topics in a different way. I really do like to share information and I’ve done it a lot on my blogs and social media – tutorials, diy’s and advice. I was initially worried about creating content that had a “what’s in it for me” message as you say, but I realized after reading your post that it’s an excellent way to build trust, and that I in fact trust brands more when they are up front.